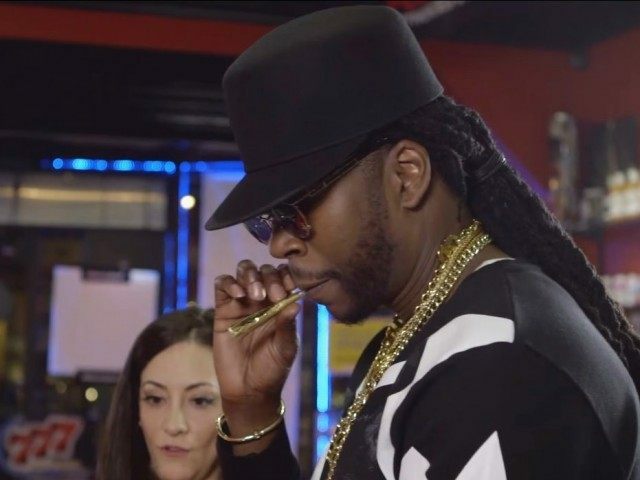 GQ magazine dropped the Season 2 premiere of its online series “Most Expensivest S**t” on Tuesday, in which rapper 2 Chainz smokes a 24-karat gold covered joint filled with $800 per ounce weed. The “Most Expensivest S**t” series follows 2 Chainz as he lives the good life, copping $30,000 headphones, eating $300 hamburgers, and sampling $1,000 ice cream sandwiches. Cue Dr. Dina, the “real-life Nancy Botwin” from the television show Weeds, who happened to have brought along the world’s most expensive, canned weed ($100 per can, $800 per ounce). Still, Chainz looks a little disappointed when he opens up one of the cans. “This s**t is like them Lay’s potato chips, you open up them sh**s and there’s only four on the inside,” he laments. As the rapper and the good doctor wait for the medicine to be rolled, Chainz pulls out a massive pipe, what he calls “the biggest in the world.” Dr. Dina uses a butane torch to spark it up, and the store quickly turns into a marijuana-infused steam room. Then comes the world’s most expensive joint. “You can actually taste the gold,” Dr. Dina exclaims.